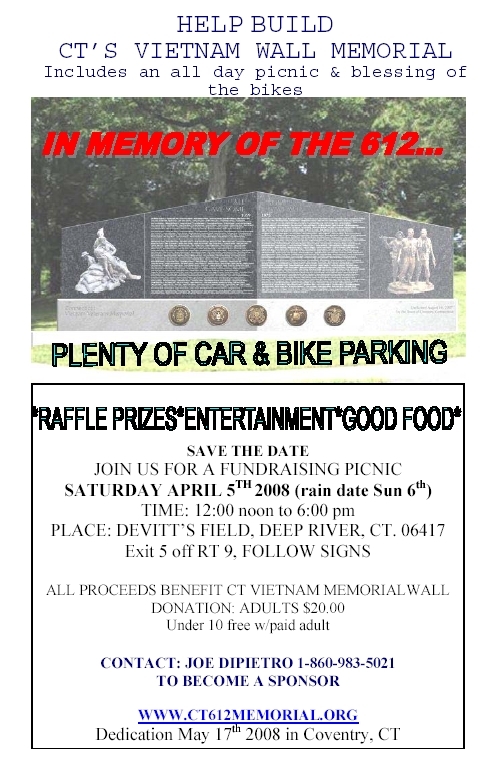 Shop Rite/Price Rite Stores to present check for $10,000.00 to CVVM, Inc. at the Connecticut Vietnam Veterans Memorial! The Memorial's foundation is complete, the granite benches have been purchased and the patio area is being poured this week. The light boxes are installed and the Connecticut Light and Power has upgraded the utility poles to accommodate the lighting. The lights at the CVVM are the same as the lights that are in Washington DC at the Wall. We have had two of the three flag poles donated and one that is under consideration. To date we have a POW Flag and Richard Blumenthal is going to provide us with the State Flag for the site. A professor at The University of Connecticut is having a group of his students work on designing the area around the memorial. The Dedication Program planning is underway and currently the Dedication Ceremonies are planned to begin at 1:00 PM on Saturday May 17, 2008. Again, without the generous contributions and support of so many wonderful people, this would not have been possible and I thank you all. The groundbreaking ceremony took place on Sunday August 12, 2007. Many thanks to those who were able to attend. Due to the generous contributions of so many wonderful people, we have currently raised $47,000.00 and The Connecticut Vietnam Veterans Memorial Wall is a work in progress. Fundraising efforts continue to raise additional monies for benches, walkways, landscaping, lighting, etc. The CVVM Committee would again like to thank all of its friends and supporters, without you this would not be possible. Thanks to the generous contributions and support of so many people we have put a deposit on the Connecticut Vietnam Veterans Memorial and work has begun. We currently need to raise $7,200.00 in additional monies to reach our goal. Thank You to all of our supporters.